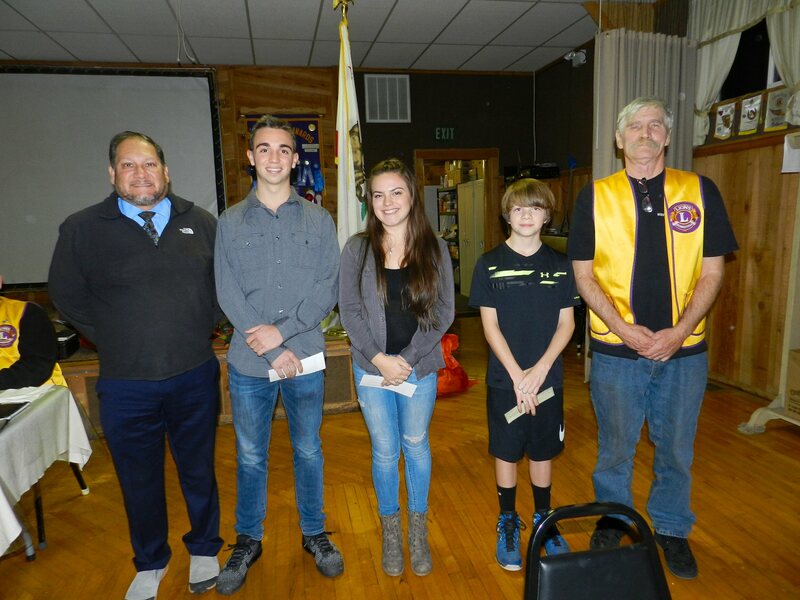 The Burney Lions Club honored three students on Thursday evening November 16. Bailey Turner was named 12th grade Student of the Month for October. Devin Murray was named 12th grade Student of the Month for November, and Eric Davies was named 8th grade Student of the Month for November. After being introduced by Burney High School Principal Ray Guerrero, each student was presented with a check by Lion George Whitfield. Turner and Murray each received $100 and Davies received $50. Bailey Turner is active in volleyball, church, Leos, California Scholarship Federation (CSF), Interact, S-Club, FNL, and Leadership Club. She enjoys reading, dancing, piano, and spending time with her family and friends. She would like to travel “everywhere.” In the future she hopes to go to college and choose an enjoyable career. She is good at dancing and making people laugh. Devin Murray has a grade point of 4.43. Principal Guerrero said that it is the highest grade point he has ever seen. Devin is involved in basketball, track, golf, Leo’s, CSF, Interact, mentoring, and Leadership Club. He enjoys science, math, sports, and cliff diving. He would like to experience sky diving. He plans to go to college and study civil engineering. He says that he is good at sarcasm. Devin’s parents Dona and Kristina Murray and his sister attended. Devin’s parents said that Devin is a great kid and they are very proud of him. Eric Davies has a 4.0 grade point average. He is good at sports and math. He is active in Pop Warner football, and Jr. High basketball. In the future he would like to go to Oregon University to play basketball and then play for the NBA. He also would like to skydive. Eric’s parents Angie and Robert Davies, his brother Drew, and his sister Ashley attended. Eric’s father works at Burney Falls State Park. He thanked the Lions and the Leos for all the help they offer at Heritage Day.